Our March cruise supplement is highlighted with the news that Her Majesty The Queen, accompanied by His Royal Highness The Duke of Edinburgh, will name the new P&O Cruises vessel Britannia at Ocean Terminal, Southampton, on Tuesday 10 March 2015. The fact that the Queen will name this latest ship gives prominence to how cruising is now the fastest growing part of the holiday industry. Cruise Lines International Association (CLIA) last week released its annual State of the Cruise Industry Report and is once again projecting strong growth in 2015. A record 23m passengers are expected to sail this year – a 4% increase over 2014 estimates of 22.1m. 61% of North American CLIA-certified travel agents report an increase in 2015 travel bookings over this time last year. Cruise lines are enticing travellers with nearly 1,000 ports of call in new, exotic locations, especially in the fast-growing Asian market. CLIA also revealed that member cruise lines are scheduled to debut 22 new ocean, river and specialty ships in 2015 for a total investment of more than US$4bn. The cruise industry has a major economic impact globally. In 2013, the global economic output was more than US$117bn; supporting nearly 900,000 jobs and contributing US$38bn in wages. 1. Travellers will continue to set sail. CLIA member ocean passenger volume is projected to increase to 23m in 2015, a 4% increase over 2014 estimates of 22.1m. 2. Size Doesn’t Matter. Five years ago, the largest cruise ship in the world was introduced with a 6,300-passenger capacity. With 22 new ocean, river and specialty cruise ships scheduled for debut this year, the focus is less on size and more on unique design and amenities. 3. Specialty cruises continue to thrive – CLIA’s specialty segments, which include sophisticated ships, luxury yachts, elegant ocean liners and the newest river cruises, continue to experience double digit passenger growth. In fact, specialty cruises grew by 21% annually from 2009 to 2014. 4. Caribbean continues to be Queen – The Caribbean remains queen for the cruise industry with more than a third of the global deployment capacity market share in 2015. At the same time, cruise travellers are expanding horizons. The Mediterranean continues to grow as a destination, as well as other regions including Asia and Australia. In 2015, 52 ships will provide 1,065 Asian cruises with capacity for 2.17m passengers. 5. New places. We will go. The cruise industry is seeing an increase in passengers looking for global experiences. As a result, cruising has made the world more accessible than ever. CLIA’s member cruise lines offer nearly 1,000 ports around the globe, including many areas that fall within a UNESCO World Heritage Site. 6. Travel agents are key to cruise travel – While the internet and mobile devices have overtaken how consumers make purchases, travel agents continue to be the most popular and best way to book a cruise. In fact, seven out of 10 cruise travellers use a travel agent to plan and book cruise holidays. 7. Passengers are at the helm – When it comes to travel, consumers are in control more than ever before. 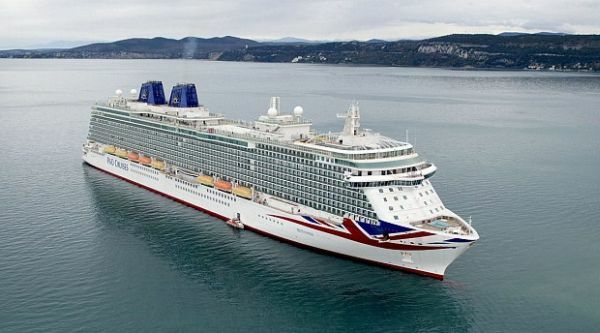 There have been two previous Britannia’s in P&O history. The first entered service in 1835 for P&O’s predecessor company, The General Steam Navigation Co. To celebrate the Golden Jubilee of both Queen Victoria and P&O itself, the company built the Jubilee Class of ships which consisted of the largest and grandest steamers (6,000 tons): Victoria, Britannia, Arcadia and Oceana. This second Britannia entered service in 1887 and was built in Greenock. The Jubilee Class ships carried 250 First Class passengers and 160 Second Class passengers and had a cargo capacity of approximately 4,000 tons. Winston Churchill sailed on Britannia in 1888 to Bombay with his Hussar Regiment before going on to fight on the North West Frontier. Britannia’s most outstanding design statement is reserved for her three-deck high atrium with illuminating Star Burst sculpture, and she also provides the largest British spa at sea, a state-of-the-art theatre with LED wall, four pools, gym, and a multi-million pound art collection including a specially commissioned representation of the “Spirit of Modern Britain” from artist Johnny Bull. The new flagship of P&O sails out of Southampton on 14 March, a 14-night trip visiting Gibraltar – Barcelona – Monte Carlo – Civitavecchia – Ajaccio – Cartagena – Cadiz and Southampton. Her programme for the summer is a mixture of mostly seven and 14-day cruises from Southampton, before an Atlantic crossing on 23 October, completing the cruise at Barbados, her home for the English winter. CMV (Cruise & Maritime Voyages), the British cruise operator, has taken delivery of its new flagship Magellan at one time Carnival’s Grand Holiday (Berlitz 1156, 46,000 tons, 1,452 passengers and 10 balcony suites). She will reposition to Greece for a docking period before sailing up to the UK for her various launch events and Maiden Solar Eclipse & Northern Lights Cruise departing 15 March. Whilst a number of changes will be made to enhance some of her facilities, including the new CMV livery, the funnel gull wings will remain attached. PRINCESS CRUISES has announced its widest ever range of UK sailings for its 2016 Europe programme. The programme includes a longer Mediterranean season from Southampton, with the 3,000-guest Emerald Princess making 15 departures between April and September next year, compared to 10 this year. The programme will go on sale on Thursday 19 March. SEVEN SEAS EXPLORER will debut in summer 2016 joining, Navigator, Mariner and Voyager. At 56,000 gross-registered tons and carrying just 750-guests, the all-suite ship description stating “every inch of the vessel evokes elegance and grace”. According to reports from New York RXR Realty and Youngwoo & Associates are considering the idea of redeveloping Manhattan’s pier 57 with a retired ocean liner as a hotel. The two companies formed a joint venture last year and are looking into bringing in a ship to the pier which sits at the end of 15th Street on 11th Avenue, and is south of the popular Chelsea Piers sports complex. The SS United States currently languishes in Philadelphia, whilst the Queen Elizabeth 2, continues to be laid up in Dubai with no news on a previously announced plan to convert it into a hotel after moving the ship to Asia. Perhaps pier 86 might be even more symbolic. QE2 and Concorde are distant cousins and both date from the 1960s. That is their berth.